Trees are fantastic. They benefit us, and our planet, in many different ways. Increasingly, people are waking up to this fact. As a result, many homeowners are putting aside a little space in their garden and planting a tree or two. If you would like to do the same, just read on. There are thousands of different tree varieties available. You just need to take a look at The Tree Center website to see what I mean. They come in a huge range of shapes, sizes and colours. When buying a tree one of the most important considerations is the height it will reach once mature. This varies vastly between varieties. For example, there are varieties of poplars that grow to 165ft. If you have a small urban garden, the last thing you need is to end up inadvertently planting one of those. You also need to think about your soil type and the climate in your area. If you buy something that cannot thrive in those conditions its growth will be stunted. OK, so those are the basic principles when it comes to selecting the right tree for your garden. Now let’s take a quick look at the different ways you could use them. The fact that trees are so interesting to look at means that they make great focal points. A stunning cherry tree in full blossom in the centre of your front lawn is a great way to add interest and make your property feel more homely. 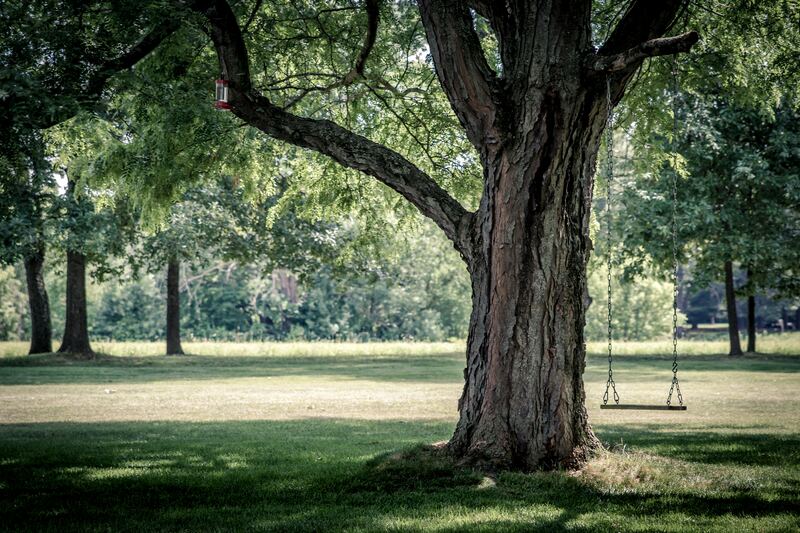 If you have the room to plant a large tree, you can turn it into a natural play space for your kids to enjoy. A child will have hours of fun swinging on a rope. Or, better still climbing up to a platform or tree house. If you want to create a shady spot in your garden using a tree is a great way to do it. Just add a bench or maybe a patio table and chairs and you are done. Planting trees is a nice way of making your garden a little more private. Using fast-growing evergreen trees, you can create a living hedge in no time. Should you choose to do this, remember not to let it grow too high. If you do not, not much natural light will get into your garden or your neighbours. Provided you plant the right type you can provide shelter and food for all kinds of insects and birds. They can also provide shade for plants that need those conditions to thrive, which will enable you to diversify what is growing in your garden. If you like to grow your own food planting fruit trees is an excellent way to do it. Once established, most of them will carry on producing fruit or nuts for decades to come. Nice article!! This is so useful. A few months back, I have planted some hedge trees for privacy from InstantHedge. It now also invites wildlife as I love chirping sounds of birds.